Ziwi does not use glycerin, yield enhancers, artificial gelling agents, fillers, or sweeteners in our recipes. Chicken is the number one protein fed globally to dogs. Our recipe contains over 91% meat, organs, bone, and green lipped mussels all sourced from accredited New Zealand free-range farms, fully balanced with all the necessary vitamins and minerals. Cans are BPA-free. No TSPP, Carrageenan, or artificial gelling agents used. Includes chicory, kelp, and parsley, plus essential vitamins and minerals for a balanced diet. 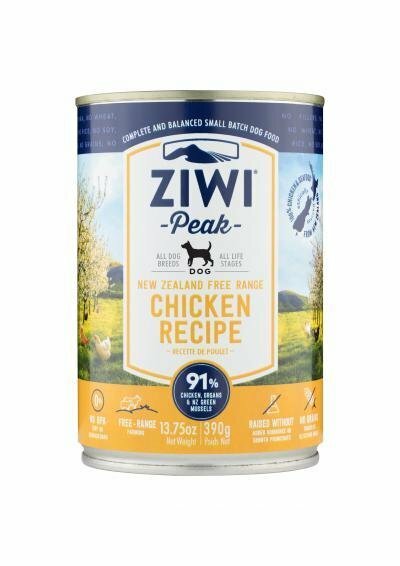 Each can of Ziwi Peak is retort-cooked in its own sterile container to preserve the nutritional integrity of the raw ingredients.